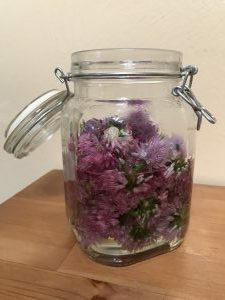 I was struggling one Saturday to get some free time so I didn’t get to customize my Harvie share from Rivendale Farms. They always offer a big variety of stuff (curse them!) and the Harvie algorithm strives to create a variety of produce (curse us!) so I wound up with a large assortment of things to cook which would be great if every day of the week I could cook a different vegetable as a side dish. But, as it happens in life right now, it’s really only the weekends that I get to do any cooking. So here it was Saturday and we’d barely touched Tuesday’s box. What to do? 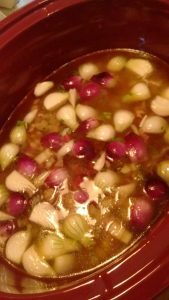 The one thing I had managed to do was make sure I had at least some savories (onions, garlic, leeks, etc. ), solid veggies (carrots, beets, squash, etc), leafy veggies (chard, cabbage, kale, etc. ), and optionally, fresh herbs (basil, oregano, parsley, etc.) because if you pick one from each of these groups, you always have a good backbone for lots of recipes. 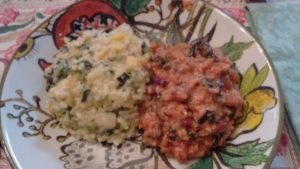 As it happened, I had a lot to choose from, so I decided to cook two big batches of risotto, mixing and matching from my share. For one risotto, I planned to cook the pearl onions (savory), yellow squash (solid), baby broccoli (leafy), and basil (herb). For the other, I chose baby leeks and chard stems (savory), baby beets (solid), chard leaves (leafy), and basil (herb). The first step was a whole bunch of prep work. I tend to prefer to have everything cut up ahead of cooking. It feels like an accomplishment and takes away the stress of doing too much later. Risotto is kind of a “fancy” but not really dish. I’m not going to look it up but I always imagine it was invented by an Italian peasant with a very very small water bucket and a well that was far away from the house. So the standard method of cooking until all the water is gone, constantly stirring so it does’t burn, and then only adding a small bit more of water each time came about by necessity. I probably don’t need to go into detail about this recipe. Basically, fill the bottom of a big pot with olive oil and cook the savories until they soften up and the house smells like heaven. (ht Isabel Allende)Then drop in your solid veggies and cook them a bit – maybe 10 minutes? Then put in your leafy veggies and cook them down. It doesn’t all have to be cooked at this point because you’re going to be cooking that rice with all this stuff for another half hour. It’s hard to keep good track of time on this because risotto is a good cooking-with-wine dish. You won’t need all of it so you can be calmly finishing the rest of the wine while waiting for the veggies. 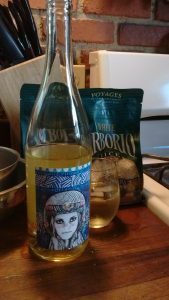 We had a subscription to Winc which was like a wine-of-the-month club. It’s almost all blends from California and the one I used here was called Funk Zone. It was tasty. So when you’re ready, you’ll also have to have a big old pot of some kind of liquid going — chicken broth, veggie broth, or just water. As I was already using up my two biggest pots and two pots of two cups of arborio rice needed a total of sixteen cups of liquid (4:1 ratio). So I just kept refilling my electric kettle and just using water with a little of this Better Than Bouillon goo that looks like Marmite. Mostly I figured all those veggies would flavor it enough. First thing is to dump the rice in dry and let it toast up in the oil for a minute or two. Then comes the wine (2:1 ratio rice:wine) and let that sadly cook itself away. Then drop in the first of the water or broth. You can go with the same amount of water as rice at first, stir that up and let the water cook away and then add 1 cup at a time whenever the mixture becomes hard to stir and makes little dry canyons when you drag the spoon through so you can see the bottom of the pot. The risotto will get creamier and creamier as you go. 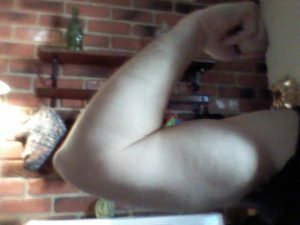 You know you are doing it right if you start to feel like Hans und Franz. The last thing you’ll add, basically when you’ve turned the heat off and used up all the water is a hefty amount of grated Italian cheese (2:1 rice:cheese) and the chopped basil. You shouldn’t need salt. The cheese will do just fine and if you’ve forgotten that you ran out of cheese, you’ll also need an awesome spouse to run to the store and the chillest baby in the world to hang out with you while you cook! Talk about a crowd pleaser that brings the WOW factor! 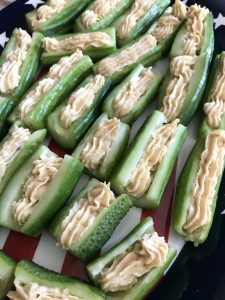 I took these to a 4th of July party and quickly saw my ‘Merica platter being passed around the room cocktail party style, serving up these fresh little bites to the curious guests. 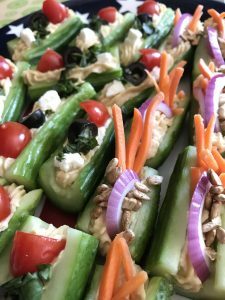 What I love about them is their simplicity, crunchy freshness and versatility – they can be topped with any ingredients you like, especially for themed parties! 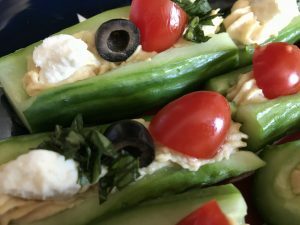 Almost anything goes with cucumbers! Gather your ingredients. I always find this helpful as it makes your prep go so much faster when you have everything in front of you ready to go! 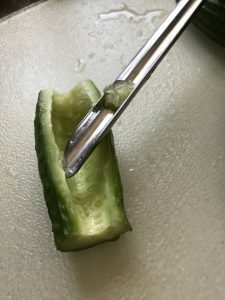 Slice the cucumber in half and scoop out the seeds. This creates the “boat” affect. Cut the slices up into bite-size pieces in any size you desire. Fill the boats with hummus. To make it easier and cleaner, I suggest using a piping bag with a plastic nozzle. 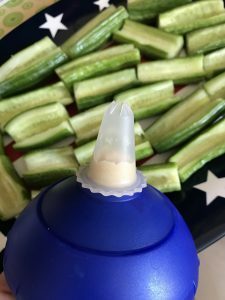 If you don’t have one, you can fasten your own with parchment paper and a nozzle or by filling a plastic freezer bag with hummus and cutting a hole in the corner of the bag to act as the nozzle. You will want to fill the boats enough so they “grab” your toppings well. Add your toppings with the amount of ingredients based on the size of your cucumber. Enjoy! Get ready to receive compliments on your creativity! Let’s talk about what we can do with all of that parsley you just got in your farm share. If you’re like me, then you know that the sauce is the boss. Today we’re making chimichurri (aka “chimi”). It’s so easy to customize, and so versatile, you’ll have no problem finding a dish to include it in. Toss it together with some grilled vegetables (summer squash or potatoes), pour some on your favorite steak, or even smear it on a toasted baguette. The foundation of chimi is very simple. You begin with garlic, red wine vinegar, olive oil, parsley, cilantro, salt, and pepper. If you’re in the camp where you think that cilantro tastes like soap, or are simply allergic, feel free to substitute it with an equivalent amount of parsley. Once you’ve got this base, the recipe is super flexible. 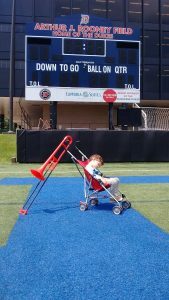 But, before you start going and practicing chimnastics, there’s two final decisions that you need to make. 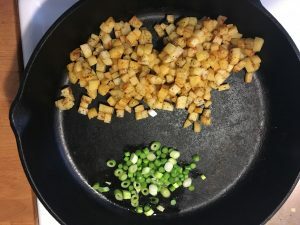 Whether or not you choose to include some form of onion and/or oregano is entirely up to you (I think they both add a nice flavor, and so should you). Be passionate about whichever combination you choose, and heckle anyone who tells you otherwise. Now you can go crazy with whatever other additions suit your taste, or pair well with your final dish. For a spicy kick, red pepper flakes are hardly optional. Or, if you’re feeling weird, fresh jalapeño is also an option. If you like your sauce more or less acidic, feel free to adjust your ratio of vinegar and olive oil. Just don’t forget the red pepper flakes. Throw everything in a medium-sized bowl, give it a good stir and season that bad boy with salt and pepper. The great thing about tacos is that you can make them out of most anything. We’re a vegetarian household so we usually do our tacos with a base of beans or something like tofu, tempeh or seitan but we also like to use potatoes and sweet potatoes as an option to mix things up a bit. As long as you have some tortillas, you’re well on your way. Your farmshare can provide you with the raw materials for many different interesting taco combinations. 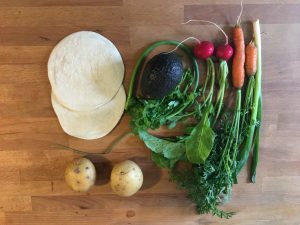 Today’s recipe for Potato Hash Tacos uses a bunch of stuff from my recent farmshare, a couple other things I picked up at the farm market this morning, some things that I just had on hand and a couple things from a trip to the local Mexican grocery. 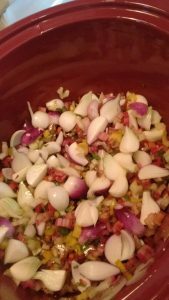 I made my slaw out of radishes and carrots – cutting them into small matchsticks and then letting them marinade in some rice vinegar and sprinkling them with some salt. Prep these first and let them marinade while you prep the rest of the taco fillings. 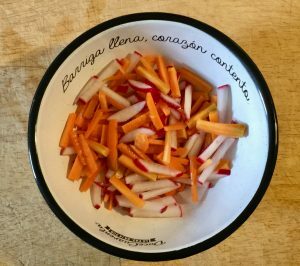 You can make this with any number of things in your farmshare – carrots, radishes, beets, cabbage, turnips, kohlrabi…really anything crunchy. Just chop it up into fine pieces that’ll go into a taco well and marinade. It’s that easy. For the filling I just chopped up the potatoes into small cubes (1/8″ or so) and tossed them in the frying pan with a bit of olive oil. Cook them up just like you are making hashbrowns/homefries. Let them get a bit brown and crispy. Sprinkle them with a little salt and pepper. I added some of that good Hungarian paprika to give them a bit of a smokey flavor. Right before the potatoes are done, I also tossed in the chopped up scallion and garlic scape. Fry that lightly and mix in with the potatoes. Once the potatoes are done, remove them from your frying pan but leave the pan on the heat. I recommend taking your tortillas and tossing them in the pan to get them warmed up. If you are doing cheese on your taco, toss some on the tortillas and let it get melty (if that’s your thing). Keep the heat down a bit and don’t leave them on too long or they start getting crunchy and burned. You just want to hit ‘em with a bit of heat to warm them up. Scoop a couple tablespoons of potato hash into each tortilla, then a pile of the slaw on top of that, add some chopped up avocado on next, then the cilantro. To finish things off, shake a little bit of hot sauce on there. 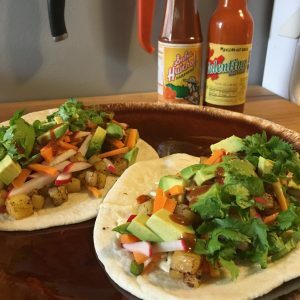 After my wife and I spent two months in Mexico over the winter, we developed a bit of an affinity for Valentina and Salsa Huichol; highly recommended but you do you. About 30-35 minutes from chopping to eating. Probably a little faster if you team up with someone in the kitchen. It’s Father’s Day so I got a chance to do one of my favorite things: cook! 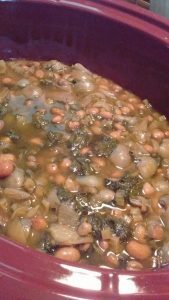 I love doing bulk cooking on Sundays with what I’ve gotten in my Harvie share from Rivendale Farms and had doubled up my order of pearl onions and chard this week to cook a big pot of beans. That’s the best thing for me about Harvie. The meal-planning aspect! Instead of figuring out what to do with 9 different things, I’ll narrow my choices to fit my narrow window of opportunity. So, let’s set to it. First thing I did was cut up those pearl onions. But they were so beautiful whole, I couldn’t bring myself to chop them fine. Instead I figured I’d try quartering them. Because they’re going to get slow cooked and pearl onions taste good boiled whole I figured this could be a good compromise. Then, I got to the chard. One reason why I often swap kale for chard is that I don’t have any use for the kale stems but chard stems make a great soup base. 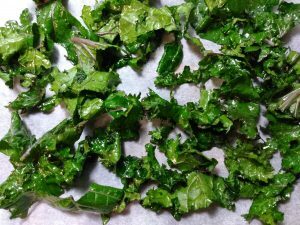 I rip the leaves from the stems and then chop the stems up fine. At this point I get out the crock pot and fill the bottom with olive oil. Then I throw in the onions and chard stems to coat and get the flavor started. While that’s going on, I go down to the pantry to select a bag of beans. We make regular orders to Rancho Gordo in California. I know it’s not local but these beans are amazing. I don’t think I’ve ever had even a single bad bean, much less a batch. I picked out some Goat’s Eye beans which are one of my standbys. You still have to rinse them up but I never presoak them. They are so good they don’t need it. Then, partly because it saves on counter space and partly because I enjoy the act, I rip up the chard leaves with my hands rather than chopping. Next, I pour the soaked beans into the crockpot and mix them around with the savory veggies. I pour enough water over top to cover by about 2 inches. I never measure how much this is. Sorry. This is also the point where any bad beans will float up to the top and say, “I’m a bad bean. Get me out.” None floated up of course. Last, I take the torn chard leaves and pile them on top. These are great for weighing down the beans and keeping them submerged so they’ll cook well. Then, just lid it and quit it! “Hey, where’s the salt, dude?” you might ask. That’s the trick to good dried beans. NO SALT until the very end. Otherwise they’ll harden on the outside. After maybe half an hour after the chard has steamed down to a manageable pile I’ll submerge the leaves around the edge of the crockpot so they’re not burning to the sides of the crock pot. After a few hours I’ll check the level of the water but otherwise just leave everything alone. In maybe another hour more I’ll test a bean. If it’s tender, then at this point I’ll add some salt and turn the beans down to warm until dinner time. We might serve with rice or bread or pasta. Meals for the week! 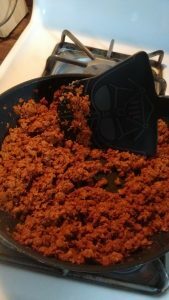 This particular day my wife had reminded me that we had some vegan chorizo that should have been eaten a few days earlier. 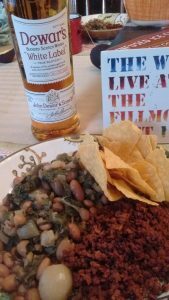 So instead of spicing up the beans, I just browned the chorizo and let the beans mellow out the flavor and serve with chips. I’d like to say I then enjoyed my Father’s Day gifts of the new release of the Who Live at the Fillmore East with some Dewars on the rocks after I got the kids to sleep but instead just passed out myself as soon as they were down. Real talk, right?? Buying a farm share from a Harvie farmer is a great first step to culinary adventures and eating healthier, but now you need to take that beautiful, farm-fresh produce out of the box or bag and put it to good use in your kitchen! Our philosophy at Harvie is that cooking is not about intimidating recipes and elaborate meals. Our obsessions with food TV like “Iron Chef” and “Chopped” make us feel like only the professionals can make food taste good. False. You can do this. Any chef knows that the ingredients make the dish – whether it’s a simple omelette or beef wellington. The point is, the quality of ingredients matter more than the number of ingredients and in your Harvie farm share you have the best ingredients! Each week Harvie provides recipes and cooking ideas (look at the bottom of your emails) based on what your farmer grew for you that week. However, even more important is to get in the right mindset. Every great meal, no matter how simple or complex, starts with high-quality ingredients. I find the joy of cooking is turning simple foods into something incredible. A simple omelette using farm-fresh eggs, spring asparagus and local goat cheese isn’t out of your reach: it’s exactly the way nature intended us to eat. Food should not be complicated. Taking a minimalist approach to preparations and recipes not only saves you time and your sanity, it allows the taste of the food to shine through. Don’t worry about making an Indian curry with 9 different spices (unless you want to!). For example, with my first farm share of the season from Rivendale Farm in the Pittsburgh, PA area, I cooked up my kale as a simple stir fry and served it over rice noodles. Helpful hint: Stir-fry of any kind is a simple way to use up veggies you have on hand. The right sauce makes the dish. Here is a staff favorite for homemade stir-fry sauce. 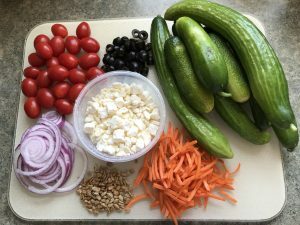 Learning how to substitute different vegetables or make variations of the same recipes to achieve different results is a way to keep your taste buds happy and your food waste low. In the stir-fry example, you could substitute swiss chard or spinach for the kale, and swap out rice noodles for cauliflower rice, brown rice, or soba noodles. As you start cooking more, you’ll become more comfortable with going off the script of a recipe. 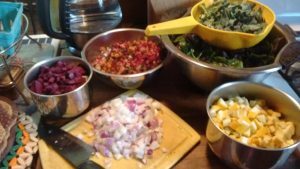 Learn some simple preparations and techniques like how to make a salad dressing or how to make vegetable soup, then these techniques can be applied to anything you have in your refrigerator. Be creative, it’s OK to fail. Helpful Hint: Coming in July, Harvie is teaming up with Cook With What You Have to bring you a monthly lesson in basic kitchen techniques. Cook, wash, and prepare in bulk when you have time and put the leftovers in the refrigerator. 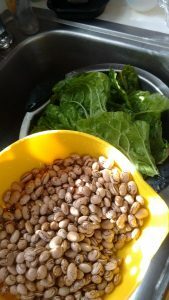 For example, when I get my lettuce home from my farm share, I immediately wash a big bowl of lettuce and put that in my refrigerator and then every time it is time for a meal, I have lettuce ready to eat. This means I eat a lot more lettuce because it is convenient and ready to go. Helpful Hint: Use this “How to Store Your Farm Share” PDF print out to help you organize and store your share! Slow down and enjoy the physical act of cooking. So many of us work in front of computers all day moving around 1s and 0s in digital space, but with cooking we have an opportunity to feel the food, to hear the sizzle of an onion, and the percussive pleasure of chopping a carrot. Take a little time to reflect on that carrot: it was grown in a particular field, on your farmer’s farm, weeded, watered, harvested, and washed by a person and delivered to you. Each carrot ties us to the land and the farm and the earth. Cooking is a moment to slow down and enjoy these connections and the timeless art of nourishing our bodies. It’s not a chore, it is one of life’s pleasures. For me, it’s beets. I want to like to beets, I really do. And everyone tells me that I will love them if I just figure out how to cook them. I’ve tried everything and I still don’t like beets. That’s OK, I simply mark my beets as a “0” in my preferences in Harvie and I’ll get more of something else I do like. So, get out there and cook! 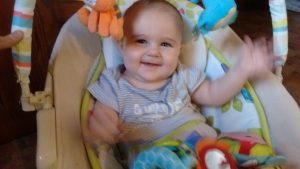 Are you having trouble with a particular item in your share? Send me an email back and I’ll try to help! 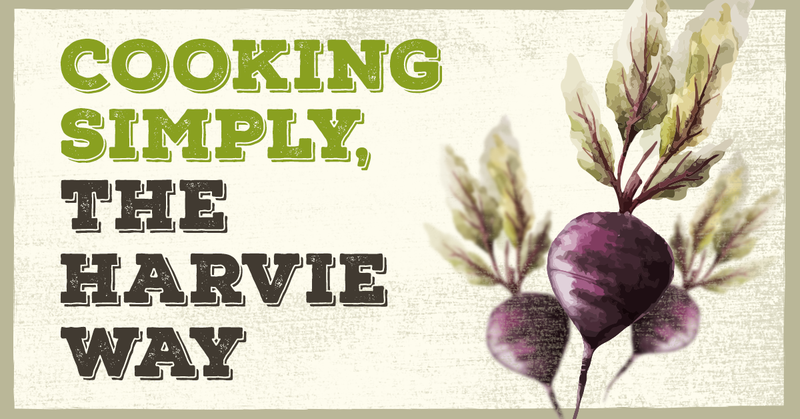 Did you cook something delicious with your Harvie farm share? Post your photo on social media tagged with #harviefarms or @harviefarms and send me a link! In the coming weeks, we will open a Harvie member community on Facebook to allow you to share your creations and help you when you are stuck, so look out for an email on that soon. This week was our first Rivendale share delivery here at Harvie headquarters, and the only thing cooler than seeing our system in action first hand was getting the fantastic fresh produce! Everything in my Rivendale box was generously portioned, perfectly fresh and bundled, and all around awesome. They might not look like much, but they are easy and delicious! 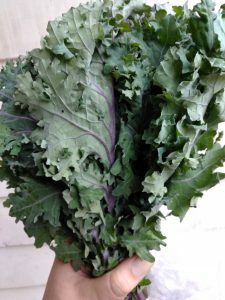 Cut the kale down from the top with kitchen scissors until the stem starts getting thick, then rip off any leaf remaining on the stalk. 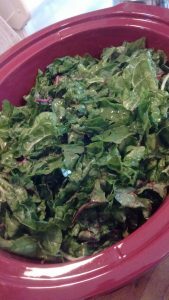 Place cut kale in a mixing bowl, add enough olive oil to very lightly coat the kale. Add seasoning of choice (I just used salt, pepper, and garlic powder). Toss/mix like you would a salad. 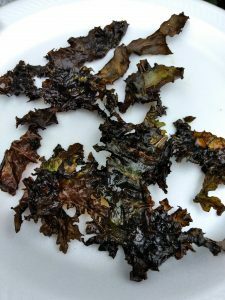 Arrange seasoned kale on a baking sheet (I used parchment paper to make clean up easier!). Bake at 280 for 18 – 24 minutes, depending on how crispy you want your chips to be. 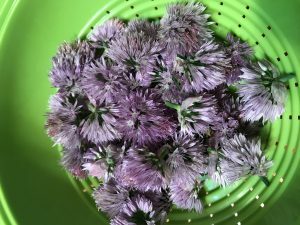 If you are growing chives or getting them in your farm share or CSA in the spring, you will start to see these beautiful, purple, ball-shaped flowers emerge from the middle of the plant called chive blossoms. Ever wonder what you can do with them? 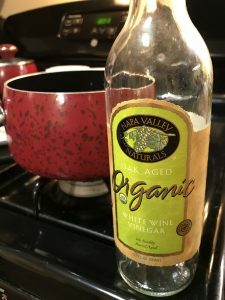 One great idea is to infuse them to create a tangy, onion flavored vinegar! 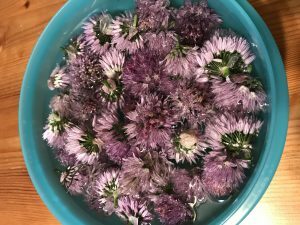 Plunge the flowers in a bowl of cold water and gently swirl them around to shake off any dirt and bugs that may have found their way deep into the blossom. Toss them into a colander and shake off the excess water. Heat the vinegar in a small saucepan over low heat until just warm, but don’t let it boil. The warm vinegar will coach the subtle flavor out of the blossoms. Stuff the pint jar with the blooms. 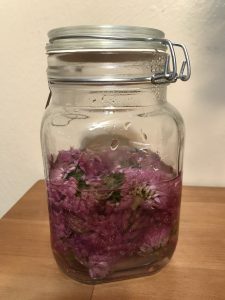 Pour the warm vinegar into the jar to submerge the blossoms. Push the blooms down until they soak up all the vinegar and don’t float to the top. Let the vinegar cool. If you have a pint jar with a glass hinged lid, then seal the jar. If you have a metal lid, place a piece of parchment paper in between the jar opening and the lid and then seal it. That way, the vinegar won’t erode the metal lid. Allow the vinegar to steep in a dark, cool spot for about 1 – 2 weeks. Taste the brew to see if you are satisfied with the flavor. When you are ready, strain the blossoms and toss them. 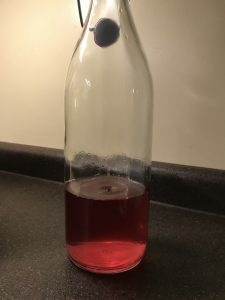 Pour the vinegar into your favorite, glass bottle with a rubber stopper and display prominently. Enjoy the beauty too! UPDATE: Here is a picture of the finished product! 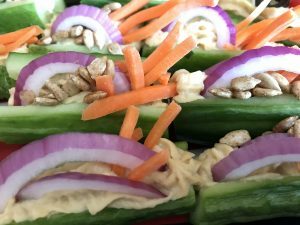 Be sure to stay tuned to our blog for many more features on seasonal food ideas!